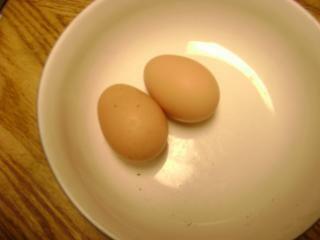 I am very new to Backyard Chickens. We have had alot of fun building the coop and getting the chickens. They are funny and the kids are having a good time with them. We are looking forward to eggs. 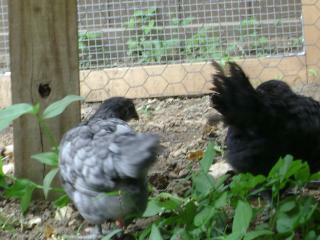 Currently we have a Maran and 2 Silkies. I have 3 more coming next week. Ha...now we are electrified. The second night a racoon got in a killed one of the original 2 (that is why we have 2 Silkies). The coop is sealed and now has an electic fence. 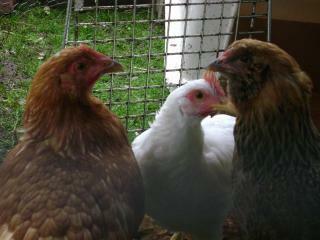 6/9/10: Added 3 more, a leghorn, a red star, and a golden laced wydonette. 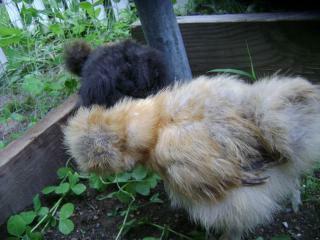 The Maran is named Pooter and the 2 Silkies are Peaches and Pear. We still have to pick out names for the new 3. New drama is getting all 6 to be together and play nicely. Well, surprise...Pear is a rooster. Peaches is sick...so am I. 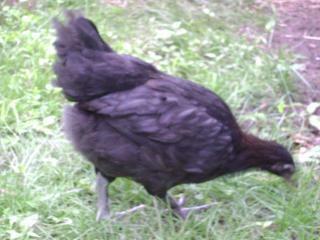 After all winter in the house, Peaches is an outdoor chicken, laying eggs, with her neck better. The ohter six weathered the winter fine and are enjoying the spring.